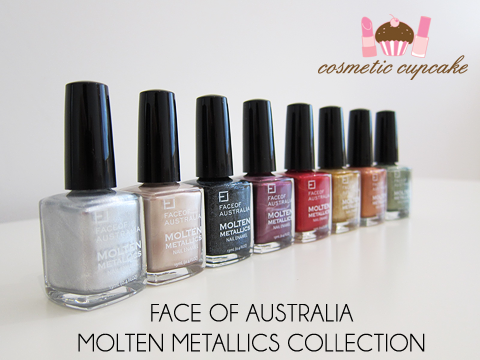 I am super excited today to bring you the soon to be released Limited Edition Face of Australia Molten Metallics nail polish collection. I showed you a sneak peek last week and I tried my very best to get them up as soon as I could! 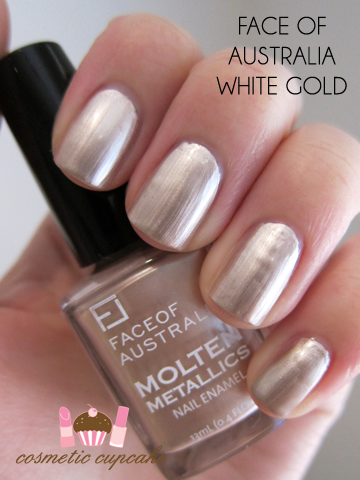 I hadn’t tried Face of Australia nail polishes before (I don’t know why!) so I was very interested to try them as I love to support local brands. "Adorn your nails with breathtaking silver, gold and bronzing shades in stunning metallic finish. A total of 8 rich, dazzling hues to make your nails the ultimate fashion statement this winter." My 1st impression when I saw these was "WOW". The collection contains 8 beautiful polishes in different finishes that are perfect for the upcoming Autumn/Winter season here in Australia. They are Big3 free and contain 13mls of polish for the princely sum of only $4.95! Today I have for you the first half of the collection. 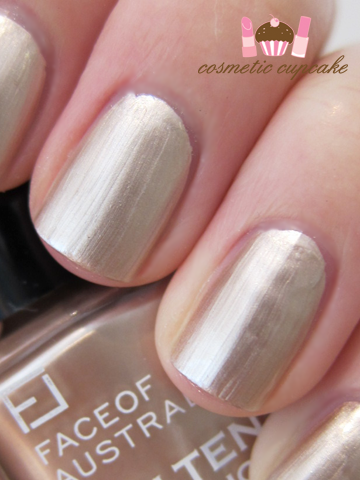 I have a tonne of swatches and I don’t want to bombard you with them all in one post! For reference, all polishes are swatched with no base or topcoat. I'm going to reserve my overall experience with the polishes for tomorrow when I show you part 2 of the collection. So, on to the pictures! Titanium - A very blingy and very shiny silver foil. It applied very smoothly and evenly and is extremely pigmented - only 1 coat is needed for opacity! You can’t have too many silver foils in your collection I say ;) The brush was easy to use and minimal cleanup was needed. This was one of my favourites from the collection. 1 coat pictured. White Gold: A very pigmented white gold, somewhat champagne metallic. Unfortunately this polish was the problem child of the collection. The formula was somewhat thinner than the others and the brush was very floppy making application extremely difficult. It was also quite brushstrokey so 2 coats was needed to even things out. Excuse the bad clean up job with this polish, I got somewhat fed up with it haha. 2 coats pictured. Iron Ore – a gorgeous black with silver and blue shimmer. This comes into it's own when it hits light and you can see all the lovely shimmer! It kind of reminds me of space. The formula is very pigmented and 1 coat is enough for opacity however the brush was difficult to use so another was needed to even out my mistakes. Another favourite of mine, black with added oomph! 2 coats pictured. Amethyst: I wouldn't really call this colour amethyst as it's a lot darker, it's more of a Tyrian purple with silver shimmer. Another one of my favourites of this collection, plus I am just partial to purples hehe. It is absolutely stunning and perfect for a night out!! The brush was OK to use and it dried to a glossy finish. 2 coats pictured. What do you think of the collection so far? Which colours take your fancy? I hope you enjoyed Part 1 of my swatches! Stay tuned for Part 2 tomorrow =) Thanks for looking! *These polishes were sent to me for my consideration. Oh my god that black one is AMAZING. It reminds me of a Chanel one from years ago, I think it was called starry starry night. I just night need to buy this one. What a shame White gold was hard to use, it looks absolutely stunning as well! 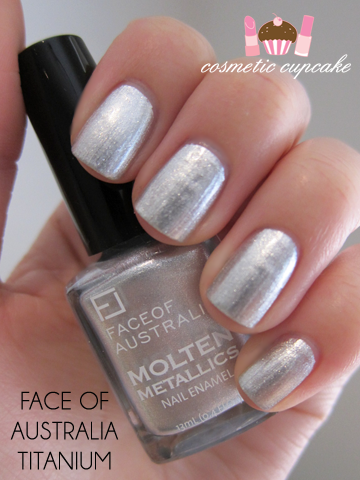 I have used Face of Australia quite a bit, and liked them. Though similar to your experience I have found the formula to be quite different accross their range. Their pastels seem to be less pigmented and require a couple of coats - but even without a top coat chiping is minimal. Then their more vibrant colours looked great with just one coat. Overall, the positives outweigh the negatives - and they are REALLY cheap! I will probably buy all of these newbies over time. wow! the colors are very pretty!! All of these colors are gorgeous! *o* I'm loving that first silver one though!! Simply stunning. Can't wait to see the rest of your swatches!!! WOW. white gold is super pretty!! These look like very cool lacquers. Your pictures are really good! I haven't tried this brand, but I want to if it's under 5 bucks, hehe. I like the silver. I don't normally like black. but Iron Ore is just so eye catching! Ooh, I think the purple might be my favourite! But seriously, this entire collection is impressive!! Ooooh the silver foil is gorg! Although they all look so nice. Iron ore is wow! Looking forward to part 2 sweetpea! Pretty to look at and I might pick one up if I came across them but I wouldn't intentionally go out to buy them, you know? Iron Ore is quite pretty though and I'm curious about that light olive/green shade. I have to get my hands on Titanium and Iron Ore! I thought I would come back and mention I saw in the latest Big W that FoA cosmetics (including nail polishes) are on special at the moment in case anyone is looking to pick these up. @Sara-May: I am a total sucker for purples of any sort and I don't have anything else like it in my collection. I was quite disappointed with White Gold but hopefully it was just my bottle. 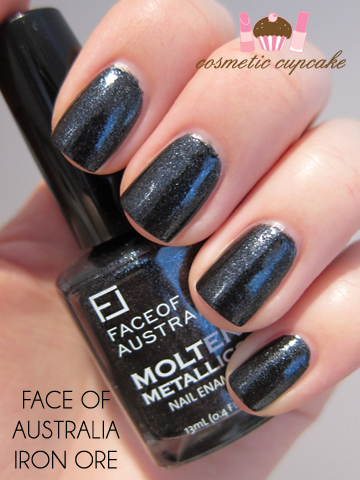 @M: Good to hear you've had good experiences with Face of Australia products! Before trying this collection I hadn't tried their polishes before so thanks for the feedback. I find with all pastels no matter the brand, they require at least 3 coats. Definitely pick some of these polishes up! @Alex: It's even lovelier in person =) and they are cheap by Aussie standards which is great. @Alice: I couldn't agree more! @tiffyma: I couldn't believe how awesome Titanium looked when I 1st applied it! @christine: If only it wasn't such a pain to apply! 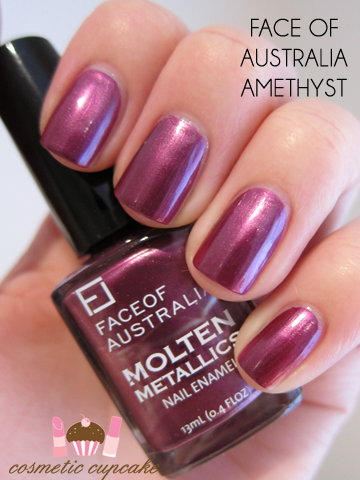 @Chris: I think it's awesome that Aussie companies are bringing out some cool polishes! @Celeste: It's not your average boring black. The shimmer sets it apart from others! @Fables in Fashion: I am super impressed with this collection. The colours and finishes are just fantastic! @Danielle: Oh yep that's understandable. These colours aren't for everyone! 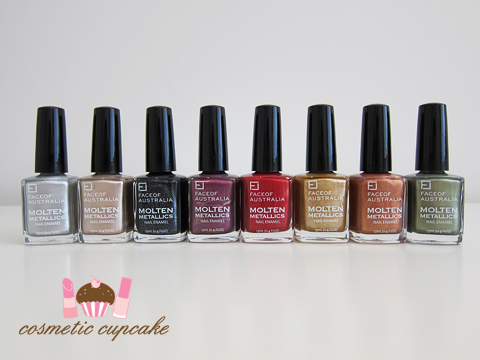 Thanks for letting everyone know about the sale =D Unfortunately these lacquers aren't available in store until May. Iron Ore is a lot like 'Baby it's "coal" outside' by OPI, that was released a few years ago. It's one of my favourites of all time. So i will deff' be checking out this colour when it hits the stores! Wow, I need Iron Ore in my life. Omgosh these colours are great! And really, only $5 for 13mL?! You must be joking! I can't believe I never had a look at FoA np! the last two are so intense! i love them! !